This is soo cool!!! Did you use Photoshop? wow! for me, this is the best picture of ur gallery! nice work dude! Very beautiful! I love the shape and shine of the light coming off the planet! Beautiful... 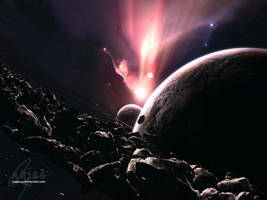 I do spacescapes myself and I still haven't reached the ability to do this type yet! The artist in me says wow .. this is awesome. The physicist in me cringes hahaha ... but to instill a counter emotion is no short feat. Great work! Wow, this is really cool. I like how their are small spherical space bodies. Amazing, how did you make those asteroids?! Any tuts, that would help me, I would be gratefull. The clarity makes you feel as if you were there. Great piece, full view is a must. Awesome piece. I like it. Instant fav. This has got to be one of the most sexiest space scenes I've seen on this site. Excellent job on this! When I first saw this, I was stunned. It's like you read my mind... I have written a story describing the exact same thing happening...and your picture is perfectly mirroring my imagination of it. I was struck by the beauty of this piece, and then by the artist's comment below it. Although I do think it's much more powerful if you had just said "Don't worry - it didn't hurt..."
But then that's just me. ^.^ Great job. You need to blend those projectiles. B-L-E-N-D and Soften. My goodness and a motion blur wouldn't hurt either. Especially on those top particles. All of the little added planets are gorgeous details and your skyscape is well done. 6 months old piece ... 1 sell, 5 wishes and 136 favs. Anyway - I am aware of these little bugs. My spacescapes imrpoved a lot since that time, so, I'm finding it quite funny to read this. I'ts like changing the flawed background on Mona Lisa painting . amazing work. how long did this take you to finish? hah wow/ well it was worth the work! Nice vertical feeling here, and the purple, and unusually vertical shape of the nebula are fantastic here. I also like how I can see something past the mist and chunks of the shattered planet. My only nitpick is there's a row of rocks that look a little too much like a straight graduating line going from large to small right over the top of the broken planet. oh btw how long did this one take? Thats really good man, love the colours and just the over all image as well. wow...such a support - I only hope it won't be too dark (some SA prints tend to be darker on the paper). I have always thought purple and space go hand-in-hand, it just seems to suit the futuristic and dark theme better than any other colour. That plus the rarity of purple space art on this site made this one really stand out. And I like the sharp beams of light radiating from the main light source.